I picked up this book solely because there is a lighthouse on the cover. My sister and I have this strange obsession with lighthouses, so when I saw a preview for the cover of Mistwalker I knew I had to have it! I am glad that I was drawn in by the pretty cover though because the story inside was just as lovely. By far my favorite thing about Mistwalker was the setting. It is set in a poor Maine fishing village. Mitchell excels at setting a scene and really drawing you in to a place. I loved her descriptions of the sea, the town, and the island with the lighthouse. I really felt like I was there with Willa. When the fog rolled in, I could feel it in my bones. Willa is a tough girl who has been through a lot. After her brother dies her lifelong plans fall apart. 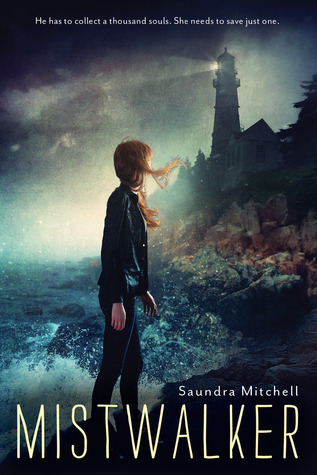 Mistwalker deals with Willa handling these changing plans, coming to terms with her brothers’ death, and figuring out the mystery of the Grey Man who lives in the lighthouse. Mistwalker is written in dual POV. The narration shifts between Willa and Grey. I loved the chapters written from Grey’s POV. He has been trapped by a curse, living at the lighthouse for the last 100 years. His voice was very distinct from Willa’s. The chapters written from his POV almost had a poetic quality. Grey was just the right amount of hopeful and melancholy. Willa and Grey were great foils to one another, while they were so different; they still had so much in common. My one main problem with Mistwalker was the legal portion of the story. There is a scene where the prosecutor comes to Willa’s house and says she has decided not to bring a case before the Grand Jury because she isn’t sure she would be able to get an indictment. There is a joke in law school that a Grand Jury would indict a ham sandwich. This isn’t even an exaggeration. Grand Juries really will indict anything. An indictment only says that there is evidence to bring a case to trial. If I didn’t have prior knowledge of the legal system though this probably wouldn’t have bothered me as much as it did. Overall, Mistwalker is a beautifully written story. The prose, setting, and characters were all very well done. I will definitely be checking out Mitchell’s other novels now. I'm intrigued by this book and I want to know the mysteries behind the Grey Man now. I'd have to agree with you about lighthouses! They are captivating, especially up close. I live in Eastern Carolina so we have a lot of them on the Outer Banks. So much history and so much beauty behind them! Thanks for sharing your thoughts! I'll be sure to check this one out!! Love this cover -- I also think lighthouses are really cool and Maine is such a beautiful place. Great review! I actually saw this on Netgalley, and hovered over the request button before moving on. I have too many to get through LOL. But the cover attracted me also. Glad you loved it!